You've been asking for it, and now it's here! The Black Tie Grinder - White Out has everything our regular Black Tie has, in a whole new look. 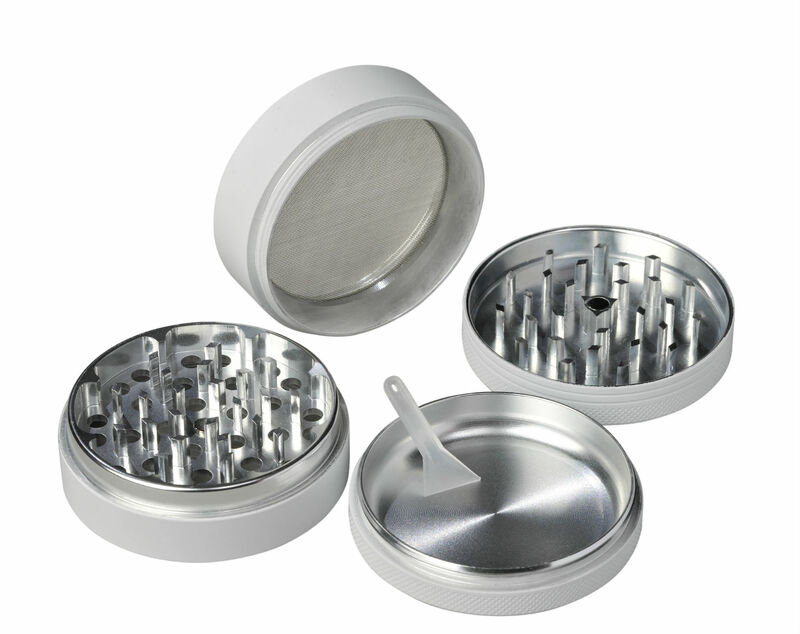 Our grinders feature 50 diamond-shaped teeth that are specifically designed to shred herb evenly. Our micron mesh steel filtering screen produces the most pollen and is reinforced by a metal o-ring. 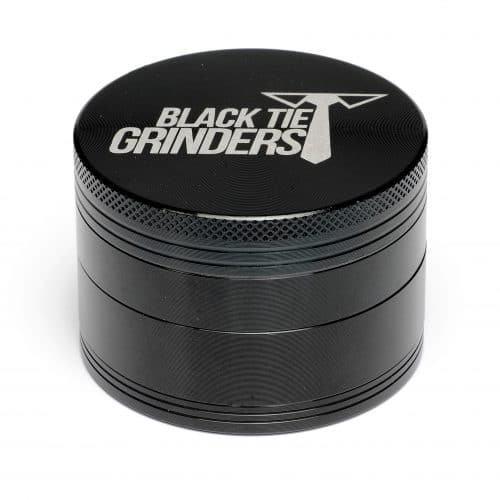 Each Black Tie Grinder comes with a velvet carry bag that protects your investment. Neodymium magnets hold the lid in place while grinding to avoid spillage. 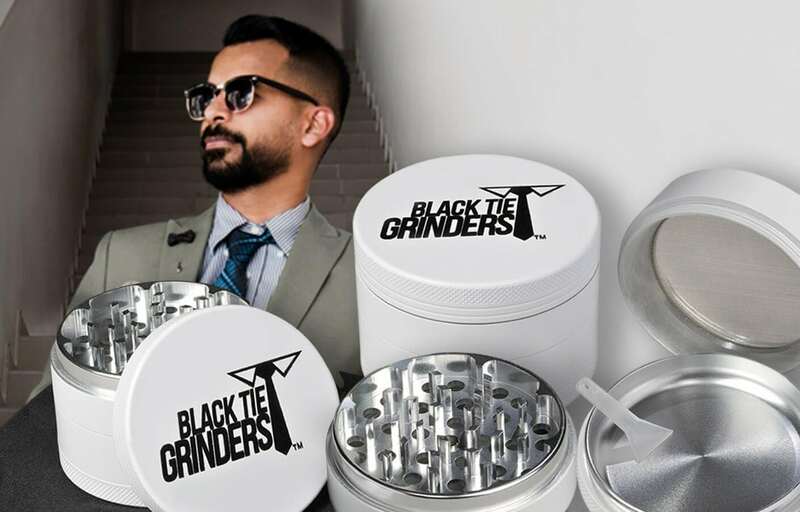 All of the Black Tie "Next Level" Herb Grinders feature a rounded pollen catcher that makes sifting through your pollen a breeze. We back our products 100%. If your grinder breaks during normal use, contact us and we will send a brand new replacement no questions asked. We are proud of our reputation, which includes a 4.5 out of 5 rating on Amazon and a 4.9 out of 5 based on the ratings we've received on BlackTieGrinders.com. See why our customers love our grinders. Let’s just say… AMAZING!!!! 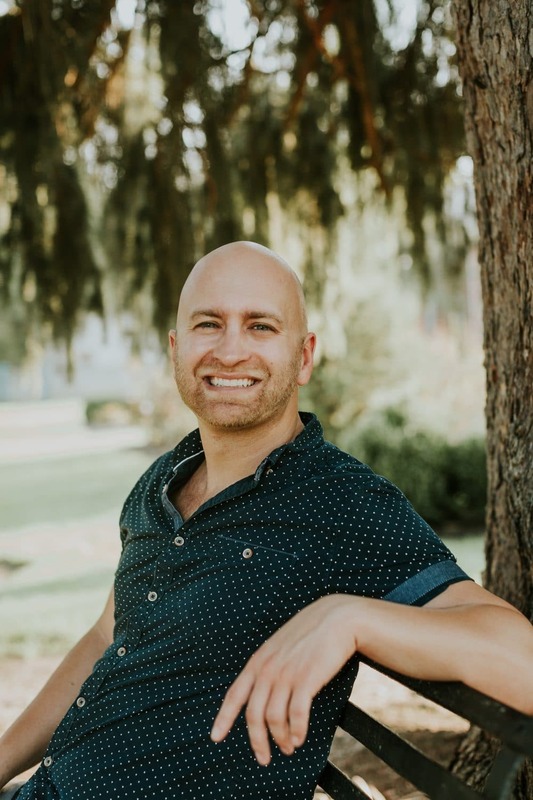 I have been in sales and customer service for over 25 years and deliver the highest caliber of both and Nick and his company exceed those standards. I am a medical patient and use very “dense” medicine. Needless to say, my main issue is pollen. Let’s just say I have ruined grinders from $5 dollars to $120 dollars. The Black Tie Grinder is absolutely perfect for pollen!!!! From the screen to the rounded edge catch tray…. Absolutely Perfect!!!! Everything gets through that is supposed to and nothing that is not supposed to. Also the machining is the Greatest design ever!!! There are only 2 threads so it will not let you over-tighten to “the point of no return” and have to use power tools to get it open! Also, it is probably almost impossible to mis-thread because again there are only 2 threads!!! And lastly, I reached out to Nick because I wanted to speak to someone before I shelled out more money and complete frustration with no compensation AGAIN!!! Nick got back to me inside of a day and a half! Pretty good for a Global Company!!!! Not only was he a total professional but he is also a very understanding person. And now, for the “Cherry On Top”. 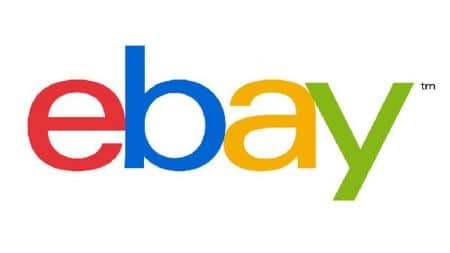 He said that if I have any issues or am not 110% satisfied, I can return it for a full refund no questions asked and the best part is that you can return his product no matter “what you put in it”. What!!!!!! I challenge anyone to find a Company and a product that will let you do that!!!! Take it from the the pickiest and most hard to please person on the planet…. Nick, his company, and his product are bar none, hands down, the ABSOLUTE VERY BEST EVER!!!!!!!! No need to do anymore research…. I did that for all of you!!!! Thanks again Nick!!! You guys are the Best!!!! I'm impressed. It's a bigger grinder than I was expecting, which was a nice surprise. I was expecting one of those mini ones. It has strong magnets and is very very smooth to turn. There are curved edges in the ground herb chamber so it makes pouring out the herb really easy and mess free. It produces a lot of kief which is awesome, and comes with two plastic scrapers to help you get that precious dust out without wasting any. Can't believe I used that dumb grinder I had for so long when I could have been using this. This new grinder is mind-blowing. The feel and look are great, and I’d be completely satisfied with how efficiently and conveniently it does its job. However, the rounded pollen catcher and the amount of pollen it produced in the few days I’ve owned it have made me your new biggest promoter. I can’t stop telling people about your product. The customer service I have received since ordering the grinder is the cherry on top. I’m a black tie customer for life! I was looking for a nice quality grinder a long time, when I stumbled upon the Black Tie Grinder. I‘m always trying to get the best for my buck and this gem gives me everything I want. Wonderful sharp teeth, light handling, well manufactured metal and a good quality coating that doesn‘t wear off after a month. 5/5 stars, have already recommended to all my friends! My name is Nick, owner of Black Tie Grinders. I wanted to give you a bit of background on our herb grinder brand and how we got started. In 2014, I had grown frustrated with the choices when it came to buying an herb grinder. It seemed that I either could get a cheap piece of crap that wouldn't last more than a few weeks, or I'd be required to spend upwards of $75 to get something decent. I knew there was a better way. I became determined to create a grinder brand that had the quality of the premium priced grinders while remaining affordable to the masses. 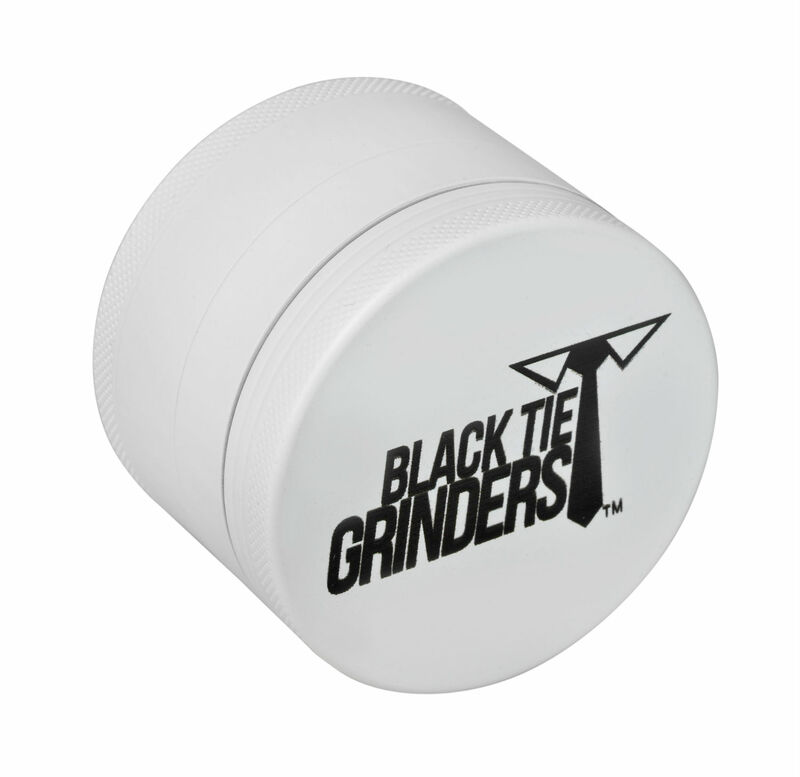 With a lot of persistence and a bit of elbow grease, Black Tie Grinders was born. Since this time we've been blessed to be featured in some of the most prestigious publications for herb grinders including Men's Journal, Herb.co., High Times, and Dude, I Want That. We've also expanded our grinder models to include the Pink Bow and White Out versions. In 2016, we began selling our standard Black Tie Grinder - Next Level in the EU marketplace, making our grinders available to over 25 countries in the European Union. We remain a small company, and that's how I like it. Time given to our customers and a positive buying experience are at the top of our priorities. Please see our testimonials and all our product reviews to see the reputation we have built. This I am most proud of. Lastly, buy with confidence. I personally work hard to make sure every customer is satisfied. If for any reason you are unhappy with the grinder you can return it for a full refund, no questions asked. Thanks for visiting Black Tie Grinders.com! For those who love cooking or other activities where herbs are used, an herb grinder is a must-have accessory. This product uses teeth to grind herbs easily and efficiently so that you're not spending long hours breaking down herbs into small pieces with your fingers or with scissors. While there are many different types of herb grinders out there (see below) they all work to break down herbs so that they are left in a ground state that is even and fluffy. Materials used to make herb grinders range from cheap acrylic plastic to top of the line anodized aluminum. We highly recommend that you spend the extra money to get a grinder made of anodized aluminum as it will do its job better and last longer. You'll also want to look for an herb grinder with strong lid magnets that will help hold the pieces in place while grinding. Having a grinder with strong magnets means that spills are less likely to happen and the grinder lid will stay in place. We'd also opt for a four-piece grinder, as they have the pollen micro-filtering screen and pollen compartment that allows for you to collect the finest and purest pieces of herbs giving you more bang for your buck. The amount of herb grinder brands and types of herb grinders has exploded in recent years. You now have more options than ever and it helps to know the pros and cons of each herb grinder type so that you can make an educated purchasing decision. By far the most common type of herb grinder out there is a manual herb grinder. Both our Black Tie Grinder and Pink Bow Grinder are manual grinders. Manual grinders usually come in two or four pieces. The two piece version will include two sets of teeth that have a magnet. Four piece versions include the lid, filter, micro-filtering screen, and pollen compartment, which you can learn about here. To operate a manual grinder you'll need to use both hands to twist the lid and filter in opposing directions. This allows for the teeth to shred the herbs. Because of this if you have arthritis or another condition that makes you weak, a manual grinder may not be the best option. Since manual grinders are mechanically simple they tend to last a long time and don't have many parts that are susceptible to breaking. Crank grinders look a lot like manual grinders except for one difference, the lid features a crank (similar to a pencil sharpener) that you turn to grind your herbs. Otherwise, these work the same as a manual grinder. These are great for those who need to easily grind their herb, but want all the benefits, such as a pollen compartment, found on manual grinders. A downfall of crank grinders is that the crank mechanism contains a few moving parts that may break over time, making these less durable than manual grinders. The newest type of herb grinder is the electric grinder. These have come out over the last couple years and offer a whole new way to grinder herbs. These are battery-powered and have a button that will turn the grinder teeth and spit out the ground herbs through a hole at the end of the grinder. What makes these nice is that you no longer have to grind your herbs manually. If you have weak wrists this may be a good option. Because they are electric they are not as durable as manual grinders and they also don't feature a pollen compartment, which is a big issue for many herb lovers. 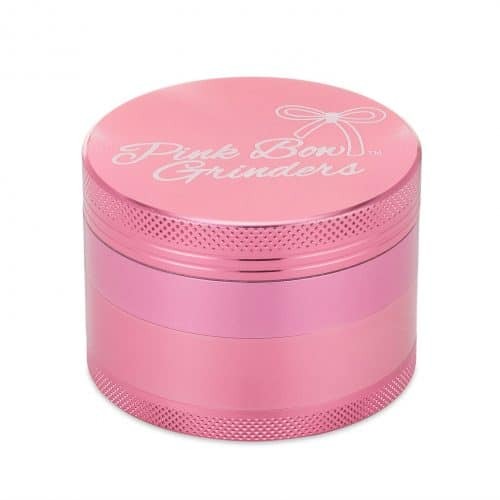 When it comes to herb grinder parts, we'll focus on four-piece manual grinders like the Black Tie and Pink Bow Grinder we sell. The four pieces that make up an herb grinder work in harmony to grind, filter, and store your herbs to keep them fresh for use. You can then use the ground herbs for cooking and any other herbal activity that you can think up. The lid of an herb grinder serves an important purpose, which is to shred whatever herbs you can find into an even and fluffy ground. Most good herb grinders will have diamond-shaped teeth that are on the inside of the lid. Generally speaking, more teeth featured on the lid results in a better grind. You may also notice a magnet embedded in the middle of the inside of the lid, which helps to keep the lid in place while in use. The second part of an herb grinder attaches magnetically with the lid. Like the lid, the filter has teeth that work in accordance with the teeth from the lid to provide a optimally efficient grinding experience. The filter also features holes throughout that allow ground herbs to fall through that are now ready for use. The filter along with the lid are the two pieces of an herb grinder that actually grind herbs. Once the ground herbs fall through the filter's holes they wind up in a compartment that features a micro-filtering screen on the bottom. This screen holds the regular ground herbs and allows only the most pure pieces to fall through to the pollen compartment. 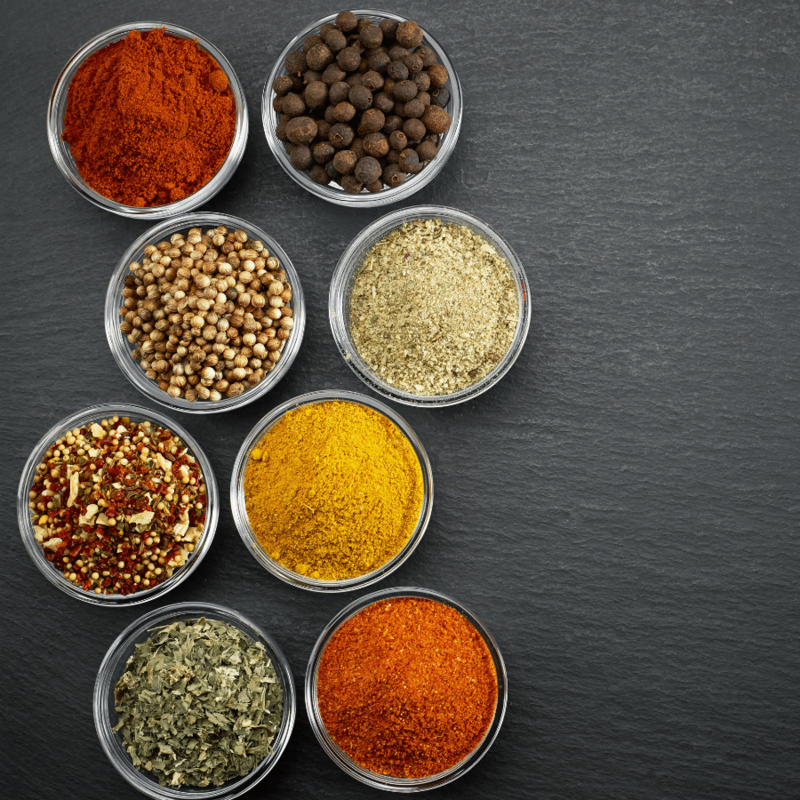 This section will store you typical ground herbs until you are ready to use them. The filtering screen is usually made out of stainless steel and has a similar pattern as what you might see on a tennis racket, though much smaller. 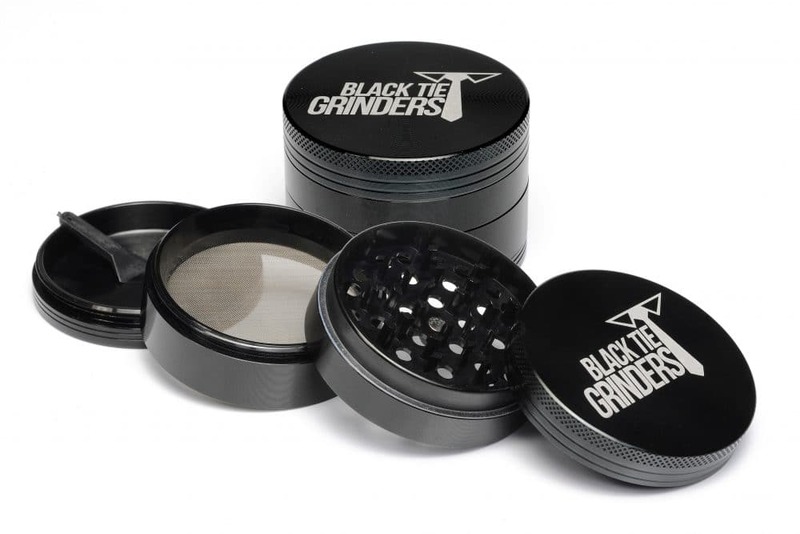 Top quality grinders, like our Black Tie Grinder, reinforce the micro-filtering screen using a metal o-ring that ensures that the screen will last for many years. Once your purest pieces of herbs move through the filtering screen they wind up in the pollen catcher compartment. This compartment helps store these fine pieces of herbs and allows you to use them when you choose. Quality grinders will have a rounded edge in the pollen catcher compartment, that can be used with scrapers and keeps the small pieces of herbs from getting stuck in a crevice. 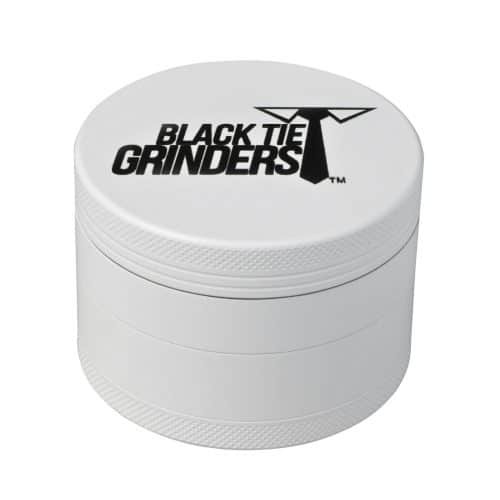 Black Tie Grinders come with two scrappers that helps you move the fine herbs from the compartment without major spilling occurring. The way you use an herb grinder will depend on which type of grinder you've purchased. If you have a Black Tie Grinder, or other four-piece herb grinder, you'll place the herbs in the filter piece (bottom part of lid) and place the lid on top, then you will move the lid and the other sections of the grinder in opposite directions allowing the grinder teeth to do their job. Once you've turned the grinder enough to grind the herbs to your liking, give the how herb grinder a shake so that the ground herbs will fall through the filter and smaller pieces will sift through the micro-filtering screen. Open the second compartment but detaching the second and third grinder pieces, and use your ground herbs as you wish. Want the pollen? You can get to it by unscrewing the bottom piece of your herb grinder. Use the provided scrapper to scrape the pollen onto your favorite dish or other purpose. Be sure to clean your grinder on a regular basis to prevent residue buildup that will impact the performance of your piece. Want to learn more about how to use your Black Tie Grinder? Check out our user manual.